Offering some of the best snow in all of Asia, Japan unarguably is high up on skiers and snowboarders bucket list. 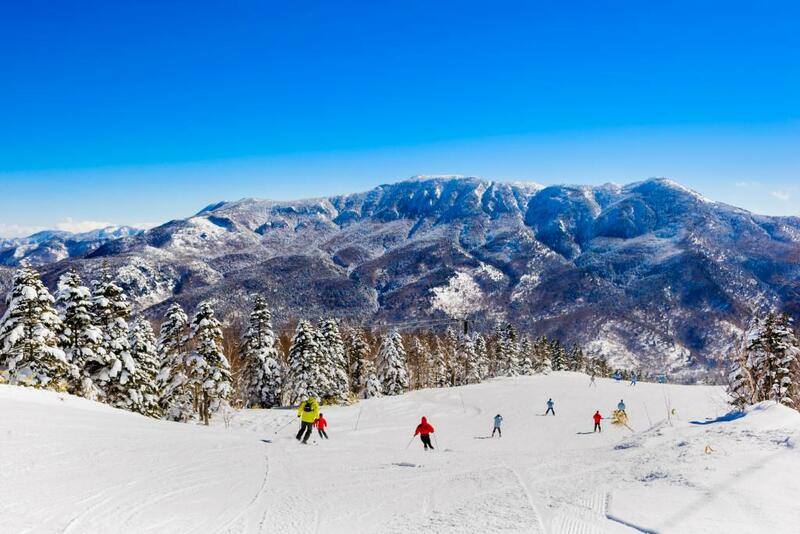 There exist more than 500 high-class Japanese skiing resorts, all over the Northern-region of the country. Get to learn all the arguments as to why a ski holiday in Japan might be the next thing on your bucket list! Averaging 600 inches of fresh and exceptional snow during the winter season (late December to early April), Japan is a powder hound’s mecca. Aside from the consistent deep powder, Japan’s snowy mountain ranges create excellent and panoramic skiing and snowboarding experience that is comparable to North America’s. Japan Skiing Resorts doesn’t only offer top-notch and all-around skiing experience but also the world’s best and centuries-old onsens. Thanks to country’s volcanic terrain, the hot spring waters are mineral-rich and therefore highly therapeutic. Japan boasts over thousands of hot spring resorts ranging from traditional public bath up to the luxurious and private open-air baths with magnificent highland views. Japan’s rich and culture and history is another reason to visit Japan for a ski holiday. The well-preserved temples, shrines, and castles attract millions of travelers annually. A culinary destination too, Japan’s healthy and authentic cuisine partnered with traditional Japanese drinks is a must after exploring and enjoying the slopes. Where to Go For Skiing Adventure in Japan? Japan’s major winter activities, fantastic culture and festivals, breathtaking mountains, luscious food and drinks, and friendly locals make skiing holidays in the country a blast. With several Japanese skiing resorts to choose from, here are some of the best and highly recommended resorts for skiers and snowboarders who want to experience Japow. Niseko is located on Hokkaido, Japan’s biggest and northernmost volcanic island. Comprised of several of Japan’s best ski resorts, Niseko skiing areas are spread over the beautiful slopes of Mt. Niseko-An’nupuri (1,308m). With a vast skiing terrain totaling 887 hectares, Niseko has been a popular international destination for skiers and snowboarders all over the world. Alongside the spectacular backcountry landscape, an average 15 m of “powder season” snowfall enriches the resort every season. Niseko skiing history dates back to 1912 when Lieutenant Colonel Theodor von Lerch skied the dormant volcano Mt. Yotei and taught Japanese soldiers alpine skiing. Niseko’s uniquely, beautiful terrain and ideal skiing conditions attract foreign skiers from every corner of the world. In 2015, Niseko won the “Japan’s Best Ski Resort” title at the World Ski Awards. Aside from being a skiing mecca, Niseko offers great winter activities like snowmobiling and snow rafting. The ski resort is home to several traditional restaurants, several with a spectacular view over Mt. Yotei. Guided tours across the mountains for sight-seeing and helicopter tours are also available in the resort. Thanks to the Siberian winds, Niseko averages twice as much snow as most resorts in North America. The renowned “Niseko Powder,” famous for its fresh light powdery snow is one of the reasons skiers love Niseko. Niseko’s skiing terrain has six different areas namely, Niseko Village, Grand Hirafu, Annupuri, Hanazono, Moiwa, and the Weiss regions. The resorts are interconnected with each other by Niseko United Shuttle. The shuttle ride is free for all “Niseko All Mountain Pass” holders. The ticket is priced at 7,400 Yen for a full day and 6,300 Yen for half day. Located on the eastern side of Mt. Niseko-An’nupuri, Grand Hirafu (combination of Hirafu and Hanazono resort) is the largest of all the ski areas connecting to Niseko ski resort. Occupying 60% of the ski resort, Grand Hirafu offers the biggest selection of skiing terrain, accommodation, and nightlife in the Niseko ski resort. Grand Hirafu has a total of 30 marked slopes suitable for all skill level. Furthermore, graded runs on the Hanazono side, cat skiing on Weiss ski area, inbound off-piste areas, and notorious backcountry terrain is also characteristic for skiing in Grand Hirafu. Every year, the resort holds extraordinary floodlit night skiing events during the winter season at the lower half of the mountain. The resort is serviced by 17 lifts in total, including one gondola, with some lifts running until 09:00 pm daily. Because of its well-maintained and more advanced skiing facilities, Grand Hirafu is the best option for ski and snowboard rentals. Located at the base area of Hirafu are the children tube parks, public and private onsens (An onsen is a Japanese hot spring), hotels and restaurants and bars and coffee shops. Hanazono offers snowmobile tours passing through the resort’s famous Strawberry Fields and Hanazono back bowls. Niseko Village, formerly known as Niseko Higashiyama, is located between Annupuri Resort and Grand Hirafu. Although it is narrower than the other ski areas within Niseko, it showcases several fun slopes for beginner-advanced skiers and some of Niseko’s steepest and longest runs for experts. The Niseko Village ski resort has a total of 8 service lifts and 27 trails featuring some long scenic pistes leading to some open glades through Niseko’s virgin forests. Niseko Village provides several steep trails like the legendary black run, Misoshiru (miso soup). It is named after the soup, as the locals believe the trail differs every time you try it. Located at the base of the resort are several hotels like the Hilton Niseko Village and The Green Leaf Niseko Village offering decadent food, hot baths, and children amenities. The resort also offers the famous traditional Japanese village dining and shopping area. Annupuri, located on the western side of Mt. Niseko-An’nupuri, is smaller and less crowded than the other Japan ski resorts in Niseko. The wide gentler slopes and the relaxing atmosphere at the resort particularly attracts beginner skier and families looking for a laid-back and more affordable winter holiday. Niseko Annupuri has 13 trails and 6 lifts, with several opportunities for an excellent skiing experience. Brave experts can easily access Annupri’s backcountry bowls which features a substantial natural half-pipe, alongside glazed slopes and sub-alpine terrain. For skiers looking to flee the hustle and bustle of Niseko, Annupuri also provides easy access to the clear and powder stashed trails of Moiwa ski resort. Annupuri is a perfect spot for skiers looking for a soothing Japanese hot bath with its numerous onsens. At time of writing, a day-pass to Annupuri is 500¥ cheaper than the other 3 resorts pass. Cost-wise, guests are however encouraged to avail the "All Mountain Pass". This will grant guests access to all of Niseko’s ski resorts. Zao Onsen is one of Japan’s largest hot spring ski resort located in the mountains of Yamagata Prefecture. Known for its all-year, therapeutic and traditional hot springs, Zao Onsen ski resort also provides over 300 hectares of skiing range including the resort’s iconic ‘snow monster’ terrain. 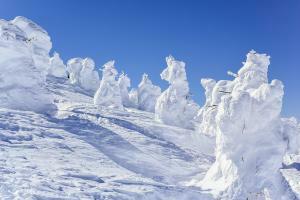 The ski resort is one of the few Japan ski resorts where Juhyo or “ice trees” appear after a blizzard. Juhyo, popularly known as “snow monsters” are formed when the Siberian winds freeze against the fir trees on the slopes of Mt. Jizo. The snow monsters look best around February. The resort h with 12 courses and 15 slopes totaling around 50km of well-groomed runs. 31 lifts service Zao Onsen ski resort with the longest Zao ropeway bringing guests and skiers over the snow monsters up to the mountain summit (1,661m). Several beginner trails can be found at the base of Zao Onsen ski resort including the Uwanodai course and Yokokura area which are open for night skiing as well. Snowboarding lessons and ski schools for first timers and pre-school children are also available at the resort. Most of Zao Onsen’s trails are dedicated for intermediate skiers including Zao Onsen’s longest course, Juhyogen. The Juhyogen is a 10 km course starts from the Jizo Sancho station located at the top of the mountain and passes through the ‘snow monsters’ terrain. There are limited options for expert skiers at the resort. One of the more interesting black trails is the Omori’s 32° gladed trails. The tickets for a full day, half day and nighter are priced at 5000 Yen, 4000 Yen, and 2000 Yen respectively for all levels. Zao Onsen is one of the largest Japan ski resorts in Tohoku region offering dozens of unique hot spring resorts. Thanks to the stunning Mt. Zao, the quality of the volcanic waters at the resort are excellent and one of the best in all of Japan. A terrain park for snowboarders, fun snow parks for the family and snowshoeing tours are available at the resort. The ski resort features several winter attractions including the Zao Juhyo Fireworks Festival, tours on the Snow Monster terrain and the Juhyo Illumination show. Nightlife at Zao is vibrant with an abundance of izakaya (Japanese pub) themed bistros and hotels and ryokans (traditional Japanese inns) offering outstanding dining and drinking experience. For more after-ski options, skiers can head to Yagamata which is only 40 minutes away from the resort. 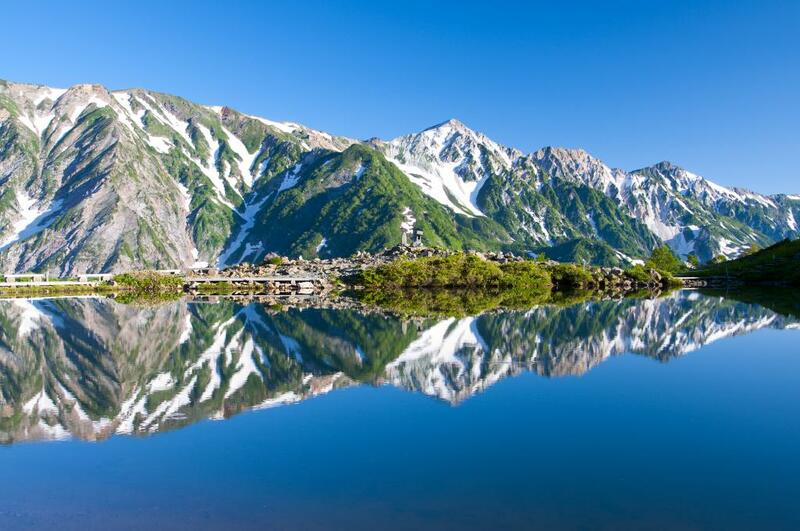 Shiga Kogen ski resort and hiking spot also referred to as Shiga Highlands, is located on the remote town of Yamanouchi in Nagano Prefecture. Comprised of 19 interlinked Japan ski areas, Shiga Kogen is considered the second largest and highest ski resort in Japan. In 1998, Shiga Kogen hosted various events for the winter Olympics, including the very first snowboarding (giant slalom) competition held at Yakebitaiyama area. Alpine skiing slalom was held at the slopes of Mt. Yakebitai too while alpine skiing giant slalom was held at Higashitateyama area. Japan ski resorts in Shiga Kogen combined, offer 80 km of trails, 980 m of vertical and are interlinked and serviced by 68 lifts. Among those 68 lifts are several modern detachable high-speed quad lifts and a conveyor belt for beginners. With approximately 600 acres of skiing range, it will take three days to explore the resort completely. It is divided into two areas - the southern area of Mt. Yokoteyama and the northern end at Okushiga-Kogen and Yakebitaeyama. Shibutoge, nestled over Mt. Yokoteyama (2,307m) is the highest ski area of all Japan ski resorts and composed mainly of gentle flat slopes at the lower area and some steep powder-filled slopes at the upper area. It is located just over Yokoteyama ski area, famous for its snow monsters; the resort also offers excellent intermediate trails with the panoramic views of Mt. Fuji and Japan Sea. Kumanoyu terrain is shaped like a mortar and is known as a great training ground for ski racers. Due to high altitude. Shiga Kogen is open until the first week of May. Kidoike ski area connects the southern resorts to the rest of Shiga. The resort is renamed to Kidoike Snow Park and offers plenty of attractions and slopes for beginners and intermediates. Okushigakogen and Yakebitaeyama are situated at the northern end of the resort. With its the high altitudes, these two skiing areas provide steep runs. Perfect for intermediate and expert riders, Okushiga has excellent powder stashed glade trails while Yakebitaeyama includes the steep slopes used for the Olympics. Ichinose is also a part of Shiga Kogen, primarily utilized by families due to its location and the fun parks. Higashitateyama and Terakoya areas deliver the longest trails in Shiga. Higashitateyama, being one of the Olympics host venues, offers some exceptional tree skiing trails and fresh powders on its off-piste areas. Terakoya, the second highest resort of all the Japan ski resorts in Shiga provides steep glade slopes and long scenic courses and is a popular terrain for ski racers. Nishitateyama, Hasuike, Maruike & Sun Valley located near the base area of the resort, are filled with well-groomed beginner trails and fun parks perfect for first-timers and families. Several long red pistes and steep trails for ski racers are offered on the nearby Giant ski area. Beginners can head next to Takamagahara Mammoth Ski Area, with its vast terrain and well-maintained slopes; the area is an excellent training ground for novices and intermediates. In addition to skiing and snowboarding, Shiga Kogen offers plenty of other winter activities. Snowmobiles, kids park and horse sleigh rides are available at the resort. Just minutes away from the resort, is the Jigokudani Monkey Park which is inhabited by 200 hot-spring-bathing, adorable snow monkeys. For skiers looking for relaxing after-ski activities, a number of hot springs can be found at the base area of the Shiga resort. Guests can also explore the 1400-year-old Zenkoji temple and historical Matsushiro Kaizu castle by just a short drive to Nagano. Accommodation is also provided by some of the Japan ski resorts on the highlands, especially in the area around Hasuike. Bars and restaurants can be found at Yakebitaiyama and Okushiga area offering Japanese, English and French cuisine. The best après in Shiga are located at Ichinose where Izakaya and Western-themed bars serve Japanese craft beers and wide variety of local and international dishes. Spread across the Northern Japanese Alps in Nagano Prefecture, Hakuba ski resort or Hakuba Valley is Japan’s largest ski resort. The large resort spanning 950 hectares with an astounding 1071m vertical drop is one of the most famous Japan ski resorts in Nagano attracting around 200,000 foreign visitors yearly. Hakuba is made up of 10 Japan ski resorts each offering exceptional ski and snowboarding experience. Hakuba’s Happo-one ski area used to be the venue for the 1998 Winter Olympics, including alpine skiing, super giant slalom and combined slalom competitions. Hakuba’s extensive skiing range is serviced by 99 lifts and receives a yearly average of 12m of snow with great quality comparable to Hokkaido’s. With over 130 slopes, Hakuba provides a variety of terrain for different rider levels including alpine and glade slopes and some backcountry and off-piste areas. Happo-one, occupying the eastern slopes of Mt. Karamatsu near the heart of Hakuba Village, is the biggest Japan ski resort in Hakuba. Beginner slopes and Kids Park can be found over the resort’s foothills. The longest trail in Hakuba is Happo-one’s 8-km beginner run. Fifty percent of the pistes are for intermediate skiers but there are areas like the Winter Olympics alpine and slalom courses that will satisfy experts too. Hakuba 47 owns the best and largest Snow Park in the valley. It is located beside Happo-one and connected to Goryu ski resort, both sharing the same lift ticket. The combined areas have a decent amount of beginner and intermediate trails and 4 black pistes in total. Goryu’s steep black piste named Champion Expert Course is a must for advanced skiers, for experts looking for more action, Hakuba 47’s backside provides an extensive terrain for backcountry skiing and snowboarding. Sanosaka is a small ski resort great for families and snowboarders. Kashimayari, to the south, is mostly crowded with Japanese skiers and has the largest night skiing area. The newest and southernmost Jiigatake is the least crowded of all the resort but offers few gentle slopes for novices and intermediates. Northwest of Hakuba village, riders can head to Iwatake for its terrain park or some cross-country trails. From Iwatake, Tsukaige can be reached by the resort’s shuttle and this area is best for beginners with its numerous wide and unobstructed green trails. Cortina and Norikura experience the heaviest snowfall of all the Japan ski resorts in Hakuba with several tree skiing and off-piste trails and a side country access. Aside from the snow monkey park and cultural sightseeing in Nagano, Hakuba offers a wide array of off-slope activities and attractions including the Nozawa Fire Festival. Snowshoe courses are available at Iwatake ski resort whereas snowmobiling tours are available at Hakuba 47. Typical of Japanese culture, après-ski in Hakuba is somehow laid back and unique including some reggae, motorbike themed and karaoke bars. Most of the resorts and hotels in Hakuba serve alcohol during happy hour and offer private open-air hot bath. Disclaimer: The ticket rates and prices mentioned in the article may be subjected to slight variations as per resorts’ pricing policies. Moreover, the season dates may also change or get adjusted due to the lack or abundance of snow. It is recommended to check the official websites of respective resorts before planning your skiing trip.